Over the decades, the U.S. has grown into a place of myth and outright lies rather than empiricism and reliable history. In a new book and TV series, director Oliver Stone and historian Peter Kuznick challenge the faux reality, says David Swanson. 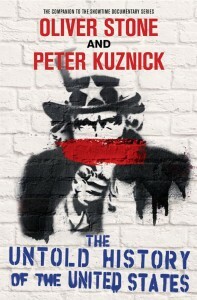 Oliver Stone and Peter Kuznick have produced a phenomenally great book of U.S. history, and an accompanying television series premiering on Showtime on Monday. Having just read half the book and having watched an advance copy of the first episode, my conclusion is that the book is dramatically better than the TV show, but that both are at the top of what’s available in their respective genres. The Untold History of the United States is not people’s history in the sense of telling the stories of popular movements. This is very much top-down history dominated by key figures in power. But it is honest history that tears through myths and presents a reality not expected by most Americans — and backs it up with well-documented facts. This is a history that focuses on foreign policy, and — at least in the book — begins with World War I. No book can include everything one might have liked to see included, but this one is a terrific sampling of things I’ve wished were told more often and things I never knew before. 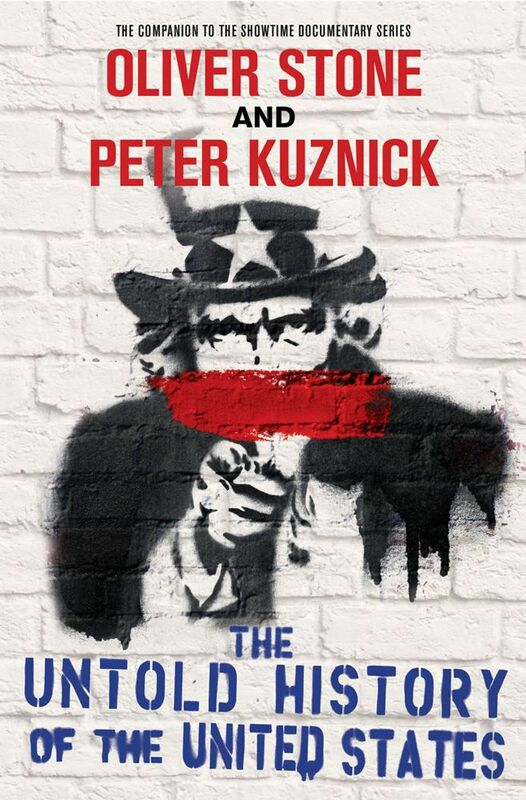 Some will call it a depressing tale lacking “all the good things the United States has done too.” I call it a refreshingly honest tale aimed at improving our conduct going forward. I also come away with a deep sense of gratitude that — for the moment anyway — our society is still around at all. After considering the steps that certain presidents and scientists have taken to destroy life as we know it, one has to be amazed we’re still here. Truman and Eisenhower figure prominently, and I believe that I have found in these authors a couple of men who might just agree with me that Harry Truman is the worst president we’ve ever seen. They certainly make that case quite powerfully. The book is excellent on World War I and on the New Deal, as well as on forbidden topics like the Wall Street Putsch of 1934 or the Nye Committee hearings on war profiteering. The section on the dropping of the nuclear bombs on Japan is the best I’ve seen. The history of the Cold War and who started it is invaluable. The authors take on McCarthyism, the Eisenhower presidency, the Mossadeq overthrow, the Guzman overthrow, the Cuban Missile Crisis, and numerous other topics with great skill and insight — and careful research. The Kennedy assassination, which Stone has famously dramatized on film before, gets a mere two paragraphs. The discussion of the formation of Israel leaves much to be desired, but at least it’s there. The Korean War account is incomplete to say the least, as is the discussion of moves to impeach Truman — for which there were motives the authors don’t touch on. But this is quibbling. I would love for everyone to read this book, and I’ll read the second half on Monday. The book’s take on World War II is far superior to that of the television show’s first episode. The episodes don’t line up with the chapters, and so — for whatever reason — the TV viewers begin in World War II, not World War I. The book has more useful material than the film and is lacking some material the film ought to have left out too. The authors are very much in favor of U.S. entry into the war and wish it had come earlier. They claim that Pearl Harbor was a surprise and reject claims that it was “abetted” by the U.S. government. But who claims that? The TV episode on WWII lacks background and context that the book provides in various chapters. The bulk of it is standard history of supposed forces at work and intentions acted on. The “untold” bits include Truman’s racist murderousness, and a particular focus on the starring role the Soviet Union played in “winning” the war. If Episode I serves to ease viewers into the fact-based reality being presented in “The Untold History,” I’m all for it. I suspect, however, that some of the other episodes that I haven’t yet had time to watch will be far more engaging and exciting, as well as controversial — or because controversial. The episode on the dropping of the nuclear bombs might be the one to start your viewing with. Or, if you really want to take my strongest advice: read the book! David Swanson’s books include War Is A Lie. He blogs at http://davidswanson.org and http://warisacrime.org and works as Campaign Coordinator for the online activist organization http://rootsaction.org. He hosts Talk Nation Radio. Follow him on Twitter: @davidcnswanson and FaceBook.